CATH IS A SIMON SNOW FAN. Okay, the whole world is a Simon Snow fan . . . But for Cath, being a fan is her life -- and she's really good at it. She and her twin sister, Wren, ensconced themselves in the Simon Snow series when they were just kids; it's what got them through their mother leaving. Now that they're going to college, Wren has told Cath that she doesn't want to be roommates. Cath is on her own, completely outside of her comfort zone. She's got a surly roommate with a charming, always-around boyfriend; a fiction-writing professor who thinks fanfiction is the end of the civilized world; a handsome classmate who only wants to talk about words . . . and she can't stop worrying about her dad, who's loving and fragile and has never really been alone. My thoughts on Fangirl in two words: SO CUTE! 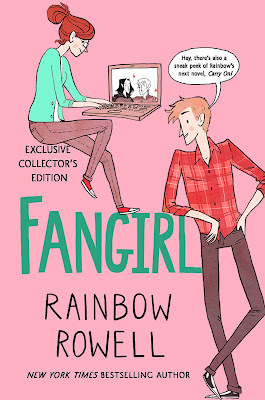 This was my first book of Rainbow Rowell's, and thankfully, I enjoyed it. I received Rowell's famous Eleanor and Park as a gift, but the first time I picked it up, I just couldn't quite get myself into it. Fangirl, however, I enjoyed from the very beginning chapters. I saw this gorgeous, pink-covered Exclusive Collector's Edition at Costco for half the normal price, and, well, I just couldn't pass up the deal. Fangirl was worth the money I spent. Our main character Cath is adorably, certifiably "nerdy" and a . . . bit on the antisocial, awkward side. She is downright relatable. She is downright funny, and she is downright human! Oh, and she has a . . . slight obsession with the fictitious Simon Snow series. I loved how Rowell portrayed Cath. We get to read her unfiltered, often quite amusing thoughts. It's wonderful. The supporting characters were also well-written. I especially loved Cath's roommate, Reagan. Her straightforwardness can be a bit off-putting, but she has a good heart and is always hilarious. It was great to see two extremely different people spend the year together and slowly learn to become friends. "Get dressed," Reagan said. "And don't argue with me. I'm not playing this game with you." And of course, Cath's love interest, Levi was another plus. I also thought he was a well-written, adorable character. Levi's a bit quirky, always fun, kind, and all around, a good guy to be around. He also has an extremely different personality from Cath's. While Cath is closed-off and shy, Levi is extroverted and the life of the party. I personally loved their contrasting personalities. Since I'm only a high school student, I can't comment on the book's "realistic portrayal" of the life of a college student, but I definitely felt it was. I love reading college stories, and Fangirl was no exception or disappointment. If you're looking for a cute, funny read, with memorable main characters, a strong family aspect, and of course, some fanfiction, then Fangirl is definitely the book for you. I really loved this one too! I've read Attachments by Rainbow, but that's it. I have Eleanor and Park and Carry On so I need to read those ASAP and then her other adult title. Rainbow writes great characters, right? Yay so happy you enjoyed it Julia. I loved this one because Cath was sooo relatable. It was like looking in a mirror (from 6 years ago, but we'll ignore that). Can't wait to see your thoughts on Carry On! This book has been on my TBR pile since ages!! I have heard so many good things about this one so glad to know that you enjoyed it!